Business rules management technology enables enterprises to express the policies, practices and procedures that govern their operations directly in a non-procedural language and embed those policies directly in multiple business systems. .NET is the ideal development environment for organizations looking to rapidly develop high performance, agile applications to automate and optimize business decisions. This white paper presents an overview of how this technology can be effectively incorporated into business-critical .NET systems to create a flexible, robust and cost-effective IT infrastructure. 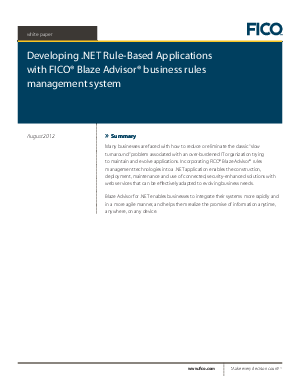 It provides an overview of what organizations should look for in business rules management solutions as well as best practices in developing and deploying rules-based applications.